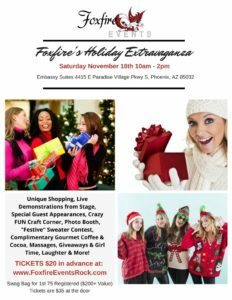 Join us for a GIRL’S DAY OUT that includes some festive FUN & FABULOUS SHOPPING with some of our favorite local retailers!!! You’ll find all kinds of things for everyone on your list… you’ll likely even find a few goodies for yourself! In addition to fun shopping among girlfriends, we’ll have useful information shared from our main stage about every 20 minutes. Expect to hear quick talks & demonstrations on things like; personal & home safety, holiday fitness & lifestyle tips, holiday entertaining ideas, creative home decor for the holidays & so much more! It’s going to be so much fun! What a great way to get us into the holiday spirit! PLUS, we have Stacey from Snapshot! Photo Booths joining us offering complimentary photo booth pictures for you & your girlfriends! She brings the props & the booth, you bring your best quirky smile & poses and ENJOY the FUN! Photo strips provided to take home free of charge! Also enjoy our complimentary gourmet Coffee & Cocoa bar while you peruse all the fabulous finds! DIY Queen Rachel Trimble of Restyle Junkie will be leading our craft corner where you get to create your own customized ornament to take home & learn from one of the DIY world’s most creative & fun gals! Available from 11am – 1pm. Wear a wacky, silly, ugly, elegant, fun holiday sweater to get in on the FESTIVE SWEATER CONTEST!!! Prizes will be awarded for the most festive!!! This will be fun for sure! WINNER announced at 12:45pm! AND, Get a chance to win the “Wine Wagon”! All guests receive one entry with their ticket. 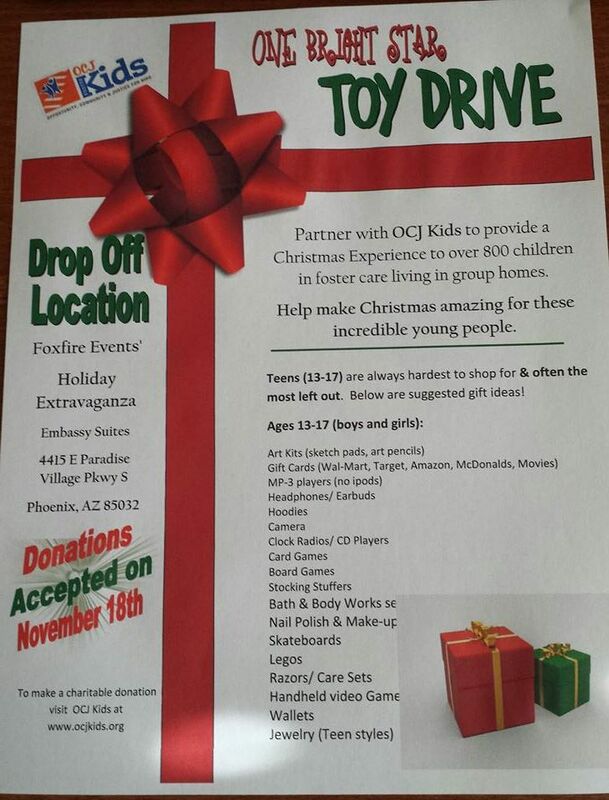 Additional entries may be purchased at the event (cash or check please) and ALL money raised there goes to support OCJ Kids a fabulous non-profit organization supporting foster kids! The holidays are so much more fun when we’re surrounded by girlfriends & take the time to laugh, love, shop & be merry! Invite your favorite girlfriends & get your tickets TODAY! $35 each day of event and at the door! 10:00am Doors Open & Shopping & Festivities Begin! woot woot! Get there at the start to get 1st pick at the best finds!!! 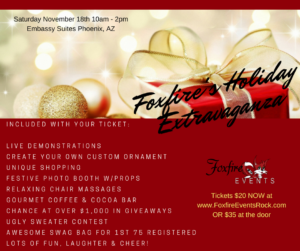 10:15am Welcome from Foxfire Events & 1st Giveaway! 11:00am – 1pm Crazy Fun Craft Corner w/Restyle Junkie is OPEN! Make a custom ornament to take home for free! 11:45 – 12:45 Reindeer Games – Try your hand at some FUN games for a chance at goofy prizes! We’ll test your competitive spirit and laugh a lot here, I promise!!! 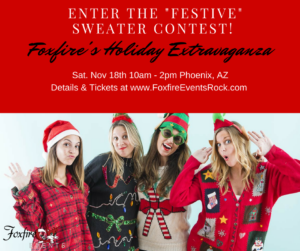 12:45pm FESTIVE Sweater Contest WINNER Announced! 1:45pm Wine Wagon WINNER announced! Giveaways throughout the day – must be present to WIN! Gourmet Coffee & Cocoa Bar available throughout! Photo booth with silly & fun props available throughout at the Snapshoot Photo Booth! Chair massages available throughout – sign up at the spa810 table as soon as you arrive!